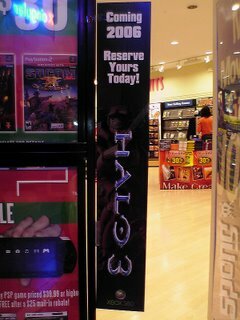 Looks like some stores are beginning to accept Halo 3 preorders with these official looking in store banners. They state the game is coming out in 2006. does this mean we should be getting some official news sometime soon? 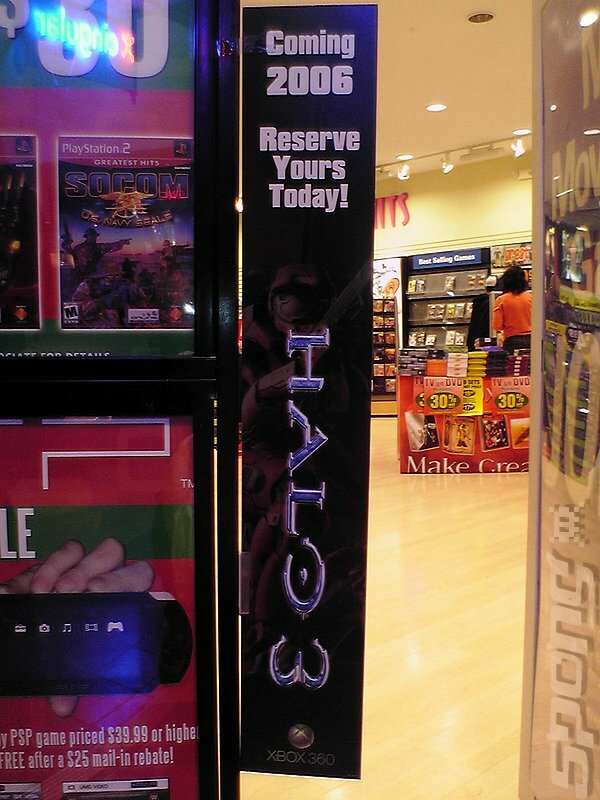 With Halo 2, Bungie caught some flack for showing a Halo 2 demo at E3 more than a year before Halo 2 was released that ended up not being anywhere in the released version of the game. From watching the behind the scenes footage that came with the Halo 2 special edition disk, it seems like that demo took a lot of development time that could have been spent on the final game. Could it be possible that with Halo 3, Bungie is just focusing on the game first and when they have that close to completed, or close to having a good idea of how the final product will be, then they will release some more information? Hopefully we'll get some kind of formal announcement (I know we will) before the game is released. Bungie hasn't even admitted to even be working on Halo 3, referring to their next project as just their "next-project" and even "Pimps at Sea" sometimes. I guess we'll see sooner than we think. You know what...on second thought, Bill Gates said in a Times article not too long ago that Sony would walk right into Halo 3 with the Playstion 3 launch. Maybe Bungie keeping mum on the release date is part of some kind of strategic planning on Bungie and Microsoft's part. Maybe the game is closer to being finished than we think if they're hoping to release it in time to soften the Playstation 3 launch. That would be interesting to see. I don't think Microsoft/Bungie would need to announce Halo 3 far in advance to build buzz, as soon as they do, people will want to buy it. Here's to hoping we get some kind of Halo 3 goodness soon.